One of the first dates J and I ever went on was to see Sugarland at the Illinois State Fair. Since then, we’ve seen Sugarland four more times. The group disbanded for a few years but recently got back together after the whole solo thing didn’t really work out for either of them. They put out a new album which means a new tour and a stop in Grand Rapids gave us an opportunity to see them for the sixth time. We got my mom and aunt to come to town to watch B. L is in Wisconsin with J’s parents so we were set up for a pretty good night out. Our original plan was to stop at Four Roses Cafe in Plainwell for dinner on our way to Grand Rapids but we realized they don’t open until 5:00. I had to come up with a Plan B quickly and once again, having a local lifestyle show on TV for white noise gave me a great idea. Long Road Distillers is the restaurant I chose after seeing a segment on EightWest earlier in the day. I knew Long Road existed but didn’t realize they had a kitchen. I thought we’d do something different and do cocktails before the show instead of a beer flight. 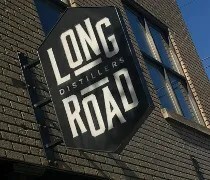 Long Road Distillers is on Grand Rapids northside. The distillery and restaurant sit at the corner of Leonard Street and Quarry Avenue. The building from the 1880’s was a clothing store called Urban Fit for many years before being turned into a distillery but had a long life before that as many different things. Getting to Grand Rapids northside was a mess on this Friday rush hour. A crash on US-131 NB slowed traffic to a crawl. We hopped off the Interstate at Wealthy and weaved through downtown to find a gravel parking lot just a few doors down that had signs saying we could park there. We walked in to a fairly empty restaurant at a little after 5:00. 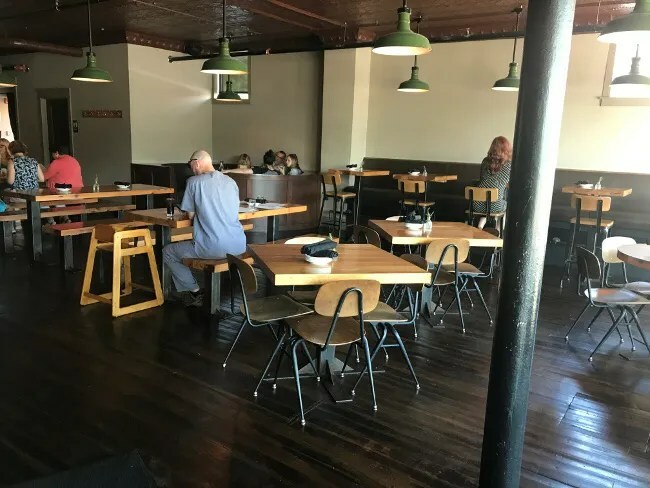 A waitress told us to grab a seat anywhere in the large dining room lit by natural light coming in from the large windows that surround the outside of the space. There were a variety of seating options from picnic tables, to pub tables, to four tops. We picked a table near the window looking back out at the rush of traffic on Leonard Street. There’s also a pretty large bar right as you walk in the door. The design choices seem to blend the historic look of the building with a modern, sleeker style in the furniture. 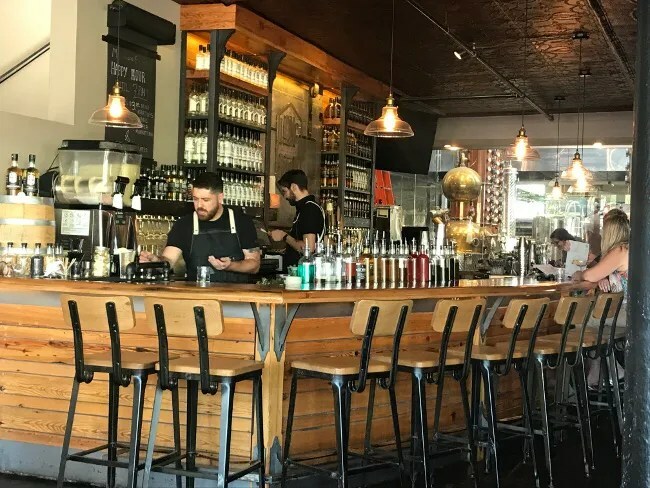 Instead of an antique bar, the design choice was a much newer, bright, streamlined bar that accents the tin ceilings and dark floors above and below it. The first waitress brought us drink and dinner menus and said our waitress would be right over. It took quite a while for her to actually make our way to us and by then, we had more than enough time to look over the large cocktail menu. J put in an order for a GR Restaurant Week special. 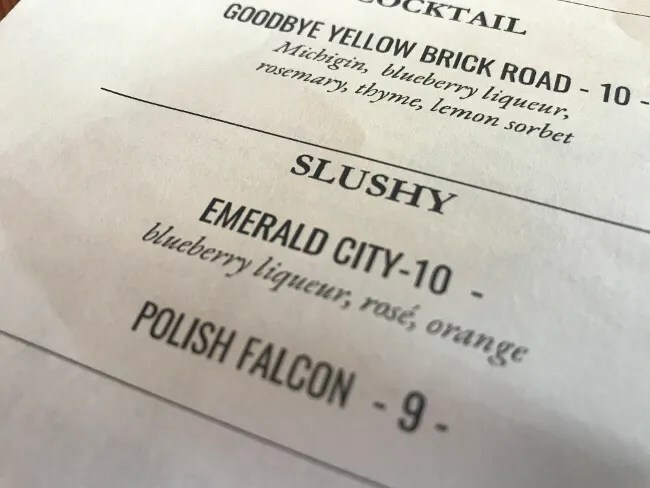 The Emerald City is a slushy made with blueberry liqueur, rose, and orange. Unfortunately, after about another ten minutes, the waitress comes over and tells us that drink is no longer available. So, she puts in a second order. The waitress told us the bar wanted to make both of our drinks at the same time so by now, we’re pushing fifteen minutes with no drinks. In fact, our food came out before our drinks did. Cocktails aren’t really my thing so I just chose the one with whiskey that sounded good to me. There are options for whiskey flights but I actually wanted a drink so I picked the Devil’s Work. 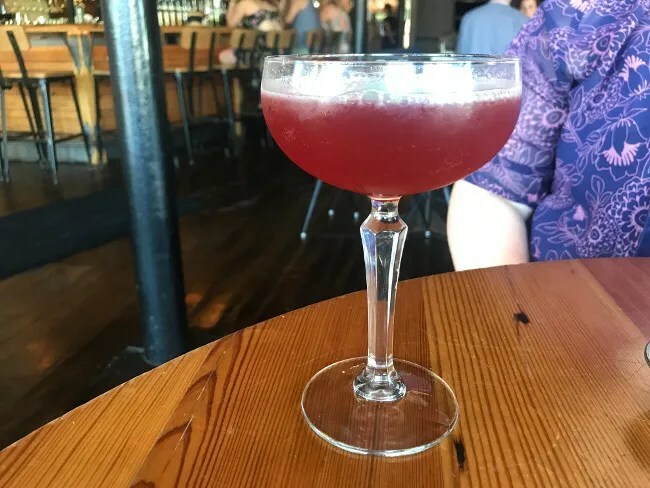 This drink is Straight Corn Whiskey, Rock ‘n Rye syrup, demerara, aromatic bitters, and a Michigan cherry. I have no idea what most of those ingredients are but they made for a really tasty drink. It was sweet from the cherry but still boozy. J’s second choice after the slushy was a drink called Swipe Left. This drink is Michigin (get it…it’s gin), Cherry Liqueur, citrus, soda, and a sage leaf. The fresh herb really made this one pop. She was disappointed the slushy was gone but was not disappointed in this drink replacement. The menu options at Long Road are salads, entrees, or sandwiches. I was really, really tempted to try the Pickle Brined Chicken, but I stuck to my habits and ordered the Burger. 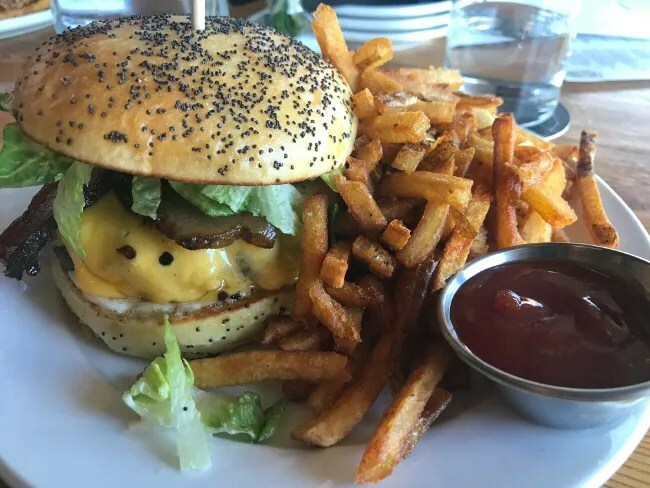 This sandwich is a patty made of a chuck and bacon blend topped with a thick slice of American cheese, shaved red onion, lettuce, and a roasted garlic aioli on a poppyseed bun. I added on a slice of thick cut bacon for two bucks. The meat patty was enveloped in a layer of cheese and the bacon was actually pretty crispy consider how thick it was. I didn’t ask for the aioli to be left off and in hindsight I should have. It was layered on pretty thick on both the top and bottom bun. It was tasty but there was too much of it. The sandwich came with fries and they were pretty amazing. There was a huge stack of hand cut, crispy potato sticks. This is really the reason I’m glad I went with the burger over the chicken. I would have been disappointed had I missed out on these delicious fries. 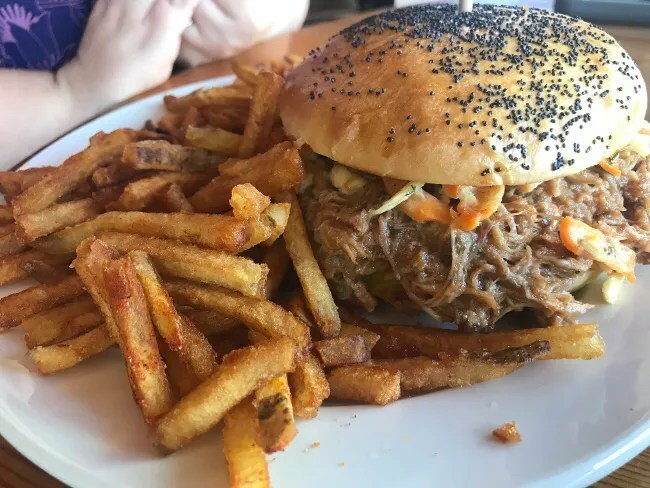 J also considered the Pickle Brined Chicken but she picked the Pulled Pork sandwich instead. This sandwich is roasted pork in an aquavit BBQ sauce topped with a Scandanavian carrot slaw and bread and butter pickles. It’s served on a poppyseed bun which J loved. I think her favorite part of this sandwich was the pickles served on the meat. The meat was delicious on it’s own but she was a big fan of the unique flavor the pickles brought to the table. Her sandwich also came with fries and, like me, she would have been disappointed had she missed out on them. Our bill before tip was a little over $41. Our only real complaint about Long Road Distillers was the service in the beginning. It took a long time to get drinks in a bar that wasn’t very busy. Once we go them, they were amazing. I never order cocktails at a bar but distillers like this could turn me into one of those guys. 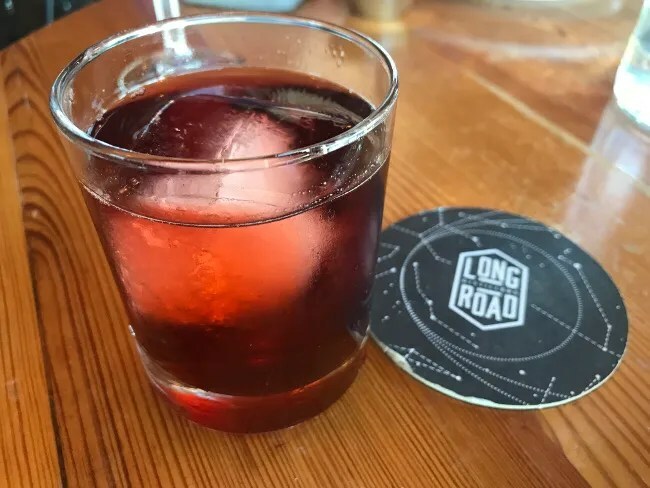 The food at Long Road is a great pairing of high quality ingredients to go alongside the craft spirits they produce. 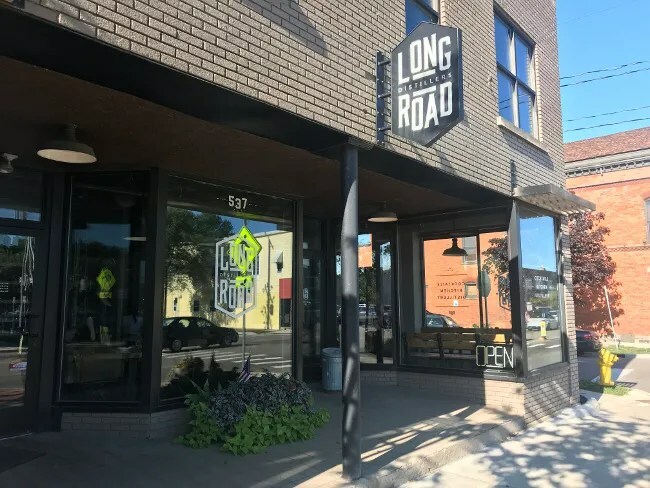 Michigan is so well known for it’s beer that it’s a little unusual to see spirits jumping into the mix but whether it’s beer, wine, or spirits, Michigan is doing something right with places like Long Road Distillers.